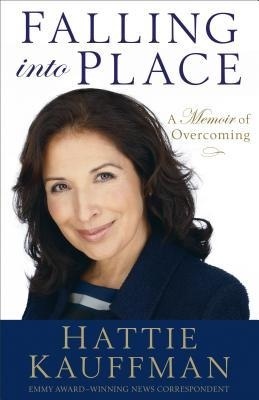 Author and four time Emmy Award-winning national senior news correspondent (Sunday Morning, 60 Minutes, CBS Evening News) Hattie Kauffman, has recently released the paperback version of her best-selling book, Falling into Place: A Memoir of Overcoming. From her humble beginnings to the bright lights of network television, Kauffman weaves a story both heartbreaking and redemptive in her new memoir, Falling into Place: A Memoir of Overcoming. Nationally recognized for her high-profile interviews and coverage of disasters and triumphs that affected millions, Kauffman candidly shares the experiences that made her into a perceptive and award-winning newswoman. In this beautifully written memoir, you’ll get an inside look into the events that shaped this remarkable woman who thought she’d left the ghosts of childhood behind. But when her world came crashing down one autumn day, she was forced to face all she had been running from. What she learned about herself surprised her. After nearly 22 years with CBS News, Hattie left the network in 2012. While at the network, she reported for CBS This Morning, The Early Show, CBS Evening News with Katie Couric (and before that, with Dan Rather), 48 Hours, CBS Special Events, CBS Radio and more. Prior to joining CBS in 1990, Hattie was a special correspondent for ABC’s Good Morning America. Kauffman is a member of the Nez Perce Tribe of Idaho and is also a speaker and writer. My review: The writing style was easy to read and well edited. The flow is much like most memoirs; smoothly flowing back and forth in time before wrapping up with more current events. For many readers this will fill their hearts with hope when there seems to be none, but for others it will come across more like a religious testimonial. For those who might need it the most I doubt they would choose to pick up this book instead of the loaf of bread and peanut butter. I received an evaluation copy through the publisher in exchange for an honest review. This in no way influenced my opinion, which may not mirror your own. No compensation has been (or will be) accepted beyond the single evaluation copy of her book.